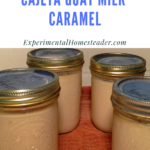 For those of us who have goats – or an abundance of goat milk – making and canning Cajeta goat milk caramel is a great way to use some of that excess goat milk. 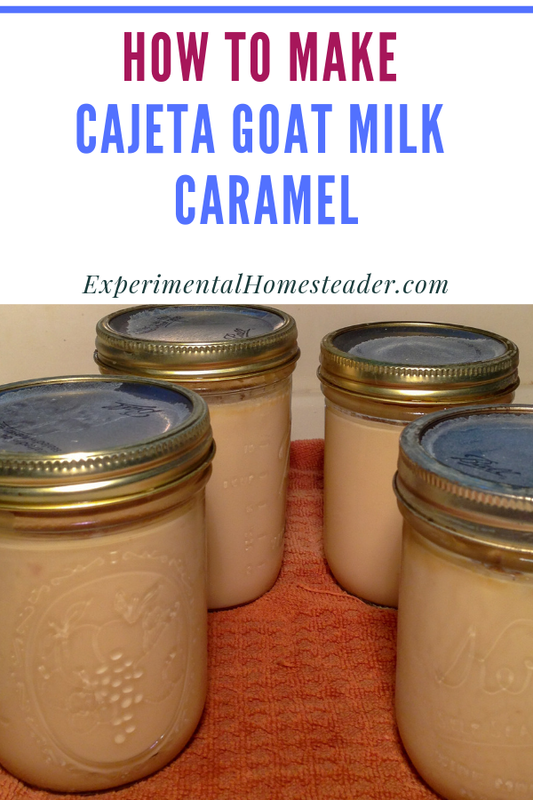 When I made my first batch of Cajeta I wondered if canning it would cause it to obtain that nasty goaty taste you get from store bought goat milk products. 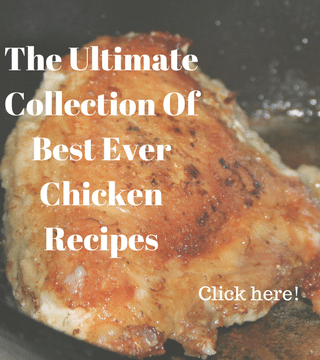 The recipe made way too much to eat before it went bad so I decided what did I have to lose? If the Cajeta took on that nasty goaty taste I would feed it to the chickens – if not, I would have a wonderful caramel dip to eat with fresh apples. 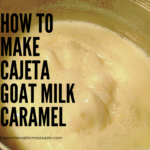 Why Make Cajeta Goat Milk Caramel? I love caramel but find it difficult to buy organic caramel locally. So, I made my first batch and canned the excess. It took over a year before I ate up all the Cajeta that I canned – and guess what? When I opened my last jar several months ago I was sad. The goats were not in milk yet and so I knew that was the last of the Cajeta for a while. Once they came into milk it seemed there was always something taking up my time and I was not able – until today – to spend the afternoon making a new batch of Cajeta. I made it a little lighter in color this time around and slightly softer than before but it still tastes good and it will be easier to get out of the canning jars. Here is how I made – and canned – my batch of Cajeta. Set aside an entire afternoon when you make this. The lower the heat, the less likely the Cajeta is to burn. 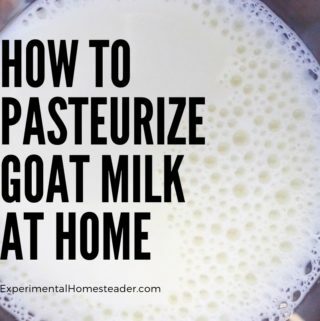 Measure the three quarts of goat milk and pour all but one cup into a stainless steel pan. Add the three cups of sugar to the pan and stir. 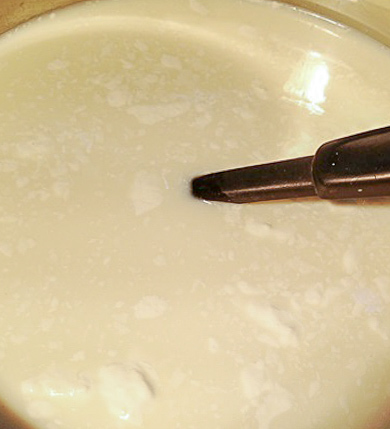 Add the cornstarch and baking soda to the cup of milk you set aside. 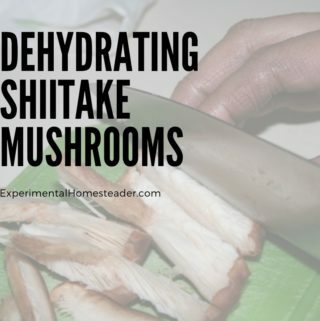 Mix until the cornstarch and baking soda are dissolved. 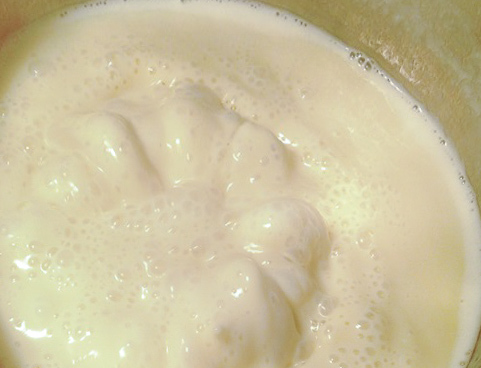 Pour this mixture into the pan with the milk and sugar. 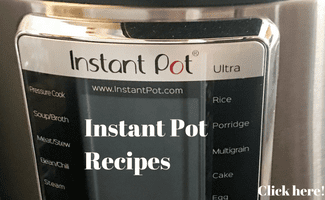 Bring the mixture to a boil – stirring constantly. 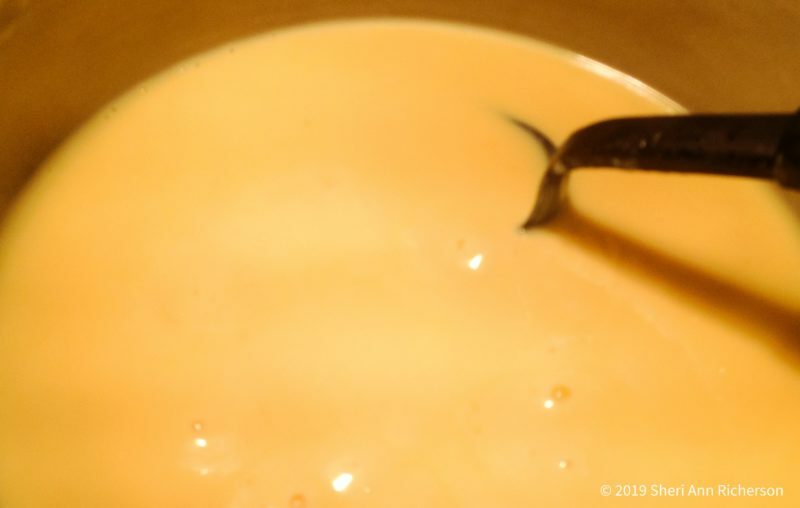 This mixture will stick to the bottom of the pan and start to burn fairly quickly so paying close attention and constantly stirring it is important. 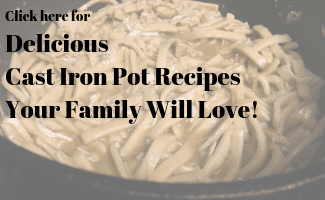 Cook the mixture until it is thick and creamy. It should look like caramel but still be pourable. When the Cajeta is finished cooking to your liking, pour it into sterilized canning jars making sure to leave 1/2 inch headspace at the top of the jars. Place the sterilized lids and bands on the jars, tighting the bands until they are finger tip tight. 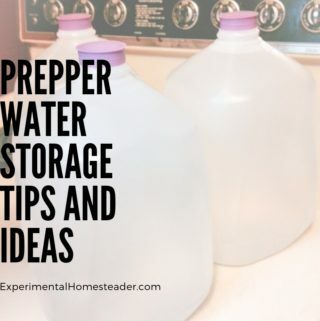 Place the sealed jars into a hot water bath canner filled with boiling water. 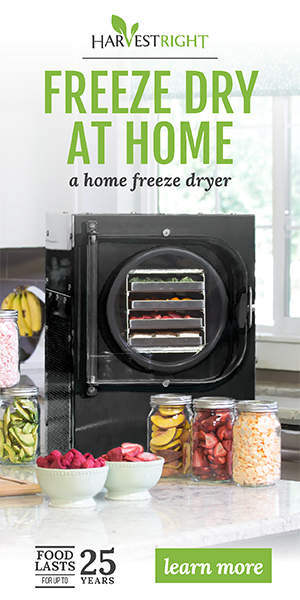 Put the lid on the canner and listen for the sound of it to start boiling again. Set your timer for twenty minutes. Remove the jars at the end of this time and allow them to cool. 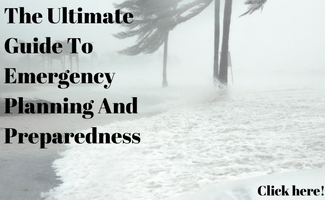 Check the seal after 24 hours. Label and store in a cool, dark, dry place. 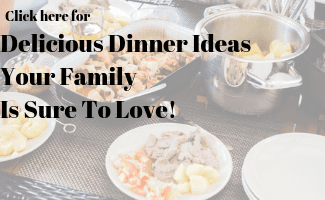 Recipes, DIY and more! All related to goat milk and goat meat. 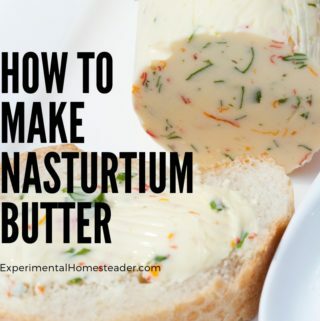 Making butter from goats milk is super easy and all you need is a kitchen blender! 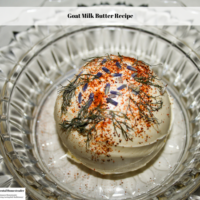 This goat milk butter recipe only takes a few minutes to make! 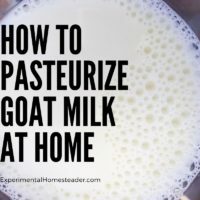 It's easy to learn how to pasteurize goat milk at home regardless of the actual method you choose to use to accomplish the task. 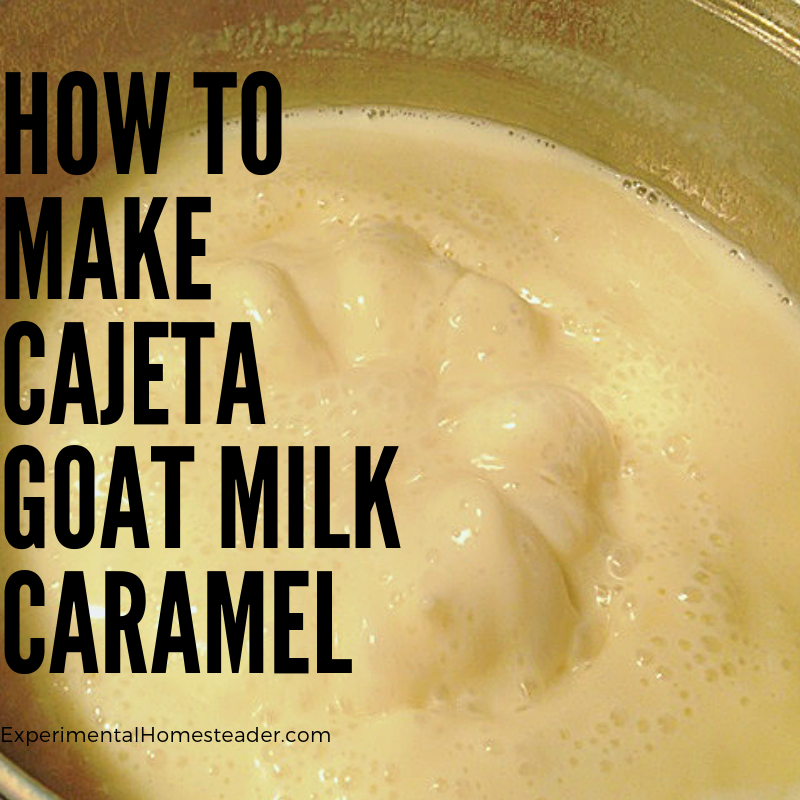 Learn how easy it is to make cajeta goat milk caramel from fresh goat milk. 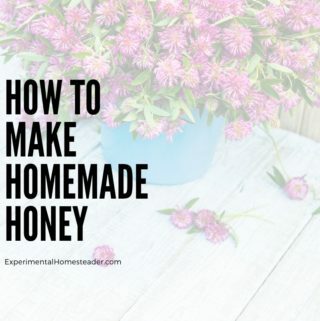 Plus learn how to preserve it for winter use by canning it. 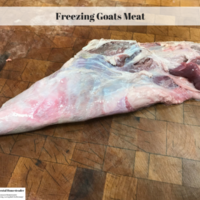 Freezing goats meat is as easy as freezing any other type of meat. If you raise goats or have a goat meat store close by this is an easy way to stock up. 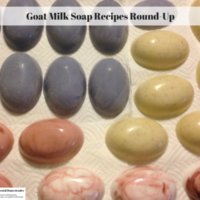 Are you looking for goat milk soap recipes? Look no further! 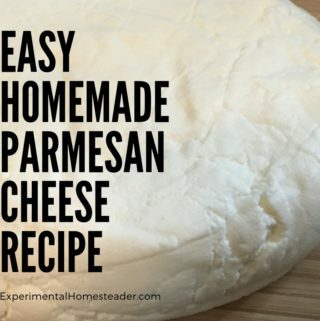 Here you find a goat milk soap recipe for liquid soap, bar soap and even laundry soap.